Does not require a filter extension. 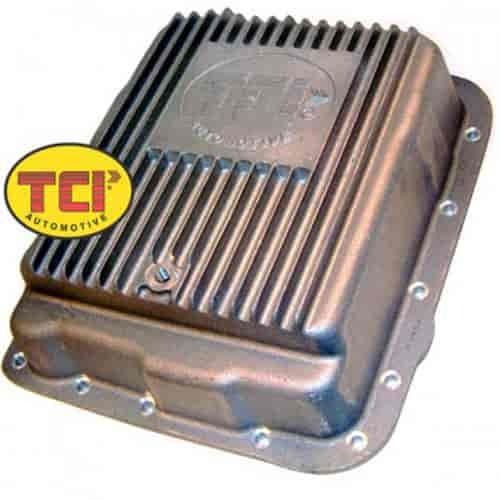 TCI Cast Aluminum Deep Transmission Pans contain cooling fins for faster heat dissipation, and are designed to add strength and rigidity to the transmission case. Each transmission pan comes complete with magnetic drain plug, pan gasket, stainless steel installation hardware, and fluid pickup extension when applicable. Requires no stock dipstick modifications. Built from aircraft-quality aluminum with extra fins for improved cooling, TCI's newest line of aluminum deep pans turns the ordinary into extraordinary. The larger fluid supply and black powdercoating of these trick-looking pans increases heat dissipation, thus reducing internal transmission temperature 20 to 30 degrees and extending transmission life. Pans include magnetic drain plug (helps keep loose metal from circulating through the transmission), Allen wrenches, stainless steel installation hardware, and O-ring seal when applicable. For adding a temperature gauge, Max-Cool Pans have a 1/8" NPT port. These transmission pans are designed to be thicker than stock pans and are a great upgrade for street rods and show cars. Polished Die-Cast Aluminum Pans feature a high luster and stock depth in case ground clearance is a concern. They have a drain plug to simplify fluid/filter changes and include all necessary gaskets, filters, and stainless steel installation hardware. Does TCI 378000 fit your vehicle? 378000 is rated 5.0 out of 5 by 2. Rated 5 out of 5 by TheCowWatcher from Great upgrade Been on my 92 S10 with a 385 and 700r4 for about a month. Transmission temps climb much slower and hold at 180 in 95 degree weather with traffic. Very pleased and the cast studs ensure the filter stays put, no extensions needed and no worry of the filter falling off. Rated 5 out of 5 by the Old Goat from Pretty enough to be a work of art. Haven't installed the pan yet because it's so hot and humid here. Bought it for my 88 Blazer that will see lots of on and off road time. I'm impressed with the quality and doubt that there will be a problem. Have a Hughes pan on my other 4x4 and they are very similar. Thank you Jegs for selling quality products.